I’ve posted pictures of my Holocaust Quilt before (original holocaust quilt post), but it means so much to me that I want all the new readers to have a look at it too. This special quilt will be the kick-off of my monthly raffle- this month the prize is a $5 gift card to my store, Sew Materialistic or a $5 coupon off your next purchase online @ www.sewmaterialistic.com. In order to enter please post a comment, “like” the page, and suggest our Facebook page to a friend. How true, they all are, and I thank G-d for them everyday. But this quilt is important to me, too, because it tells the story of my mother’s family during the Holocaust. As a religious Jew, who lost most of my family during that time, the naysayers (deniers, revisionists etc) hit a very sensitive cord in me. How could someone say it all never happened when just from one family so many perished? But the point of the quilt is not about the loss but, rather, how many of us survive today to prove that we are still here and the master race is no longer. (read more about the Holocaust quilt). If you are in NY, try to make it for a tour. Great trip! A Wonderful Letter Sent to Me. Somebody, who will remain anonymous, sent me this wonderful letter. “This may not quite qualify as ‘quiltresting’ or as material you would want to share with your readership, but I MUST share it with you! I just heard about you, ironically, (or perphaps not) from my work colleague. He just called me and we were talking about the fact that my youngest daughter will be leaving for seminary soon and we will be “empty-nesters”. I told him I have taken an interest in quilting and hope that this will help keep me busy while I’m missing my baby!! Who would have guessed that he would be a source for quilting information!! He told me his brother-in-law’s mother (ME!) has a quilt shop in Brooklyn, a website, etc., and he told me about the Holocaust Quilt!! Before I hung up the phone I found the website, the blogs, etc. and I was THRILLED!! 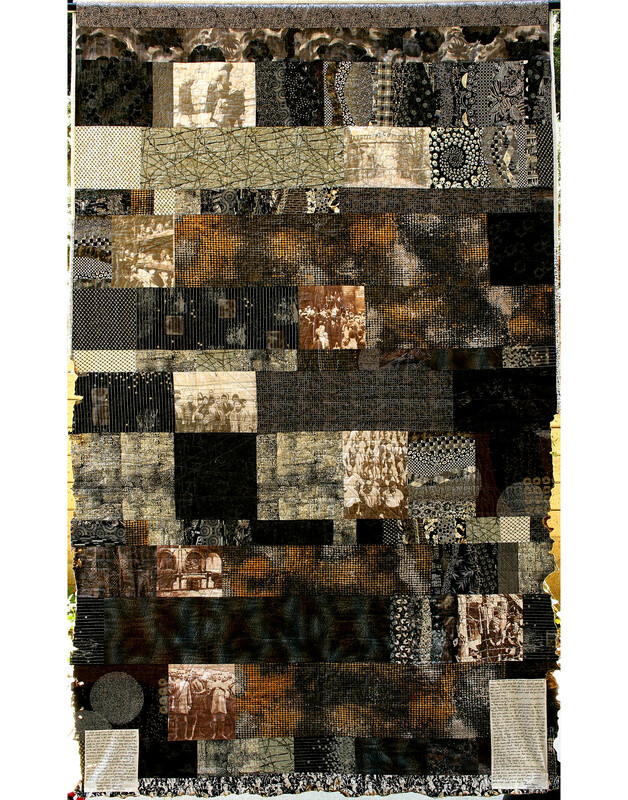 I am the daughter of a Holocaust Survivor (I created a website that you may like to have a look at: http://www.jewsoflatvia.com) and was very interested in seeing the quilt for so many reasons. My mother is an avid quilter who is ALWAYS quilting or crocheting blankets for the Linus Project. I, on the other hand, am a complete novice but have discovered crazy quilts and really want to get started with a sampler. 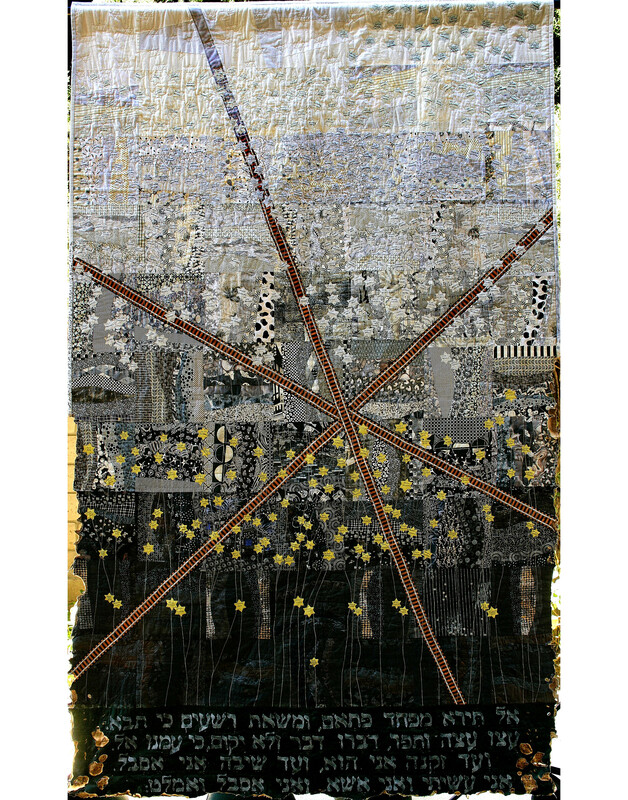 I finally found the pictures of your Holocaust Quilt by scrolling down in your blog and I was totally blown away. It is the most moving and soul-stirring quilt I have ever seen. Absolutely amazing. So funny and amazingly wonderful how by mentioning a little something to him (which, by the way, while I was saying it I was thinking – now why would he be at all interested in hearing about my foray into quilting!) could lead me to this treasure trove! As an aside, my older daughter lives in Washington Heights and I already told her about your store. She said she has a cousin (a wonderful artist) and aunt (from her husband’s side) who were interested in learning quilting, so I will definitely send them to your store! I think they live in Queens, but I will definitely pass on the info. This has not been my week. Another story about real life, or maybe only mine! I wanted to clean the filter from my air conditioner and I took it out and dropped it into the sink. I thought it was a little ratty looking but what do I know? I ran cold water over it and started ringing it out by hand. All of a sudden, my hands started hurting me like crazy and I took a good look at the “filter” it was just a sheet of fiberglass! Now both my hands were full of tiny shards of glass! I couldn’t touch anything for two days and I kept on soaking my hands and now I think most of them came out. I used my clip on glasses to find and pull out as many as I could. Lately I’ve been getting a lot of positive feedback on my Holocaust Quilt. Thank you. It’s a very precious project to me. We’ve been very busy with alot of happy occasions in the past month. my daughter-in-law had a boy, her third. my daughter had her first baby, a boy. For us that meant 2 circumcisions. one was in Lakewood NJ and one in Cleveland Ohio. we also had Passover which is always a well attended affair in my house. My son in highland park made a bar mitzvah for his second son and that was a weekend affair. My daughter came in from Argentina and we are happily busy with her. Tomorrow night we are having an affair for redeeming the first born. on may 13 my daughter is getting married. Oh what fun!!!! But exhausting. How could someone say it all never happened when just from one family so many perished? But the point of the quilt is not about the loss but, rather, how many of us survive today to prove that we are still here and the master race is no longer. The quilt represents my family’s struggle and triumph. The back of the quilt shows the darkness, on the bottom, with the names of those who were killed and then it blends to the light, on top, with the names who survived, and their children, grand-children and great grand-children.